This is the week of the year where I usually post the Hutchins Christmas letter, but I didn’t actually write one this year. In fact, I haven’t written much of anything since May. One reason is that it’s a lot of work managing employees who are administering the programs for my books. We launched three this year: Hell to Pay, Fighting for Anna, and Act One. The second reason is that I have been producing online courses for the SkipJack Publishing school for authors; that knocks out time I didn’t have. The third is that buying a house in Snowheresville, WY and a couple of enormous horses were a time-consuming and highly enjoyable distraction. The fourth is that I’ve had a run of writers block and thus wrote anything and everything except new material. The fifth is that we hosted a paleo Thanksgiving for fifteen people, six dogs, and two cats. The sixth is that I traveled multiple times with Eric and he with me on our respective work trips. The seventh is the big one. I’ve been sick. Sick in a way that started when I had my hysterectomy and horrible reaction to anesthesia in 2015 and worsened considerably in August of 2016. I’ve written about it before, so if you care, you can read it there. I don’t want to repeat it. No one was able to diagnose why the hysterectomy affected me so horribly. Lots of theories were knocked about. Thyroid imbalance. A stroke. Unexplainable reaction to the anesthesia. Nothing was confirmed and I tried lots of natural remedies (for memory), but it’s been affecting me all this time, so much so that I doubted my ability to ever write again. I have terrible short term memory. That’s not true. I have terrible memory altogether. Since my anesthesia reaction, I didn’t think I could knock out 300+ pages and hold the threads of story and characterization together. Truth be told, it was much, much harder on these last three books. But it wasn’t insurmountable. It just took more time and more help (especially encouragement and understanding) from Eric. I found it much less taxing and scary to hike, ride, and cook: things requiring less focus through my fog. Beginning in August, I noticed that my memory issues, lack of motivation, and inflammation/pain (and some other symptoms I don’t feel comfortable writing about here) were joined by a crippling anxiety and complete lack of emotional bandwidth. Since then, there have been whole weeks I didn’t write for no other reason than my inability to deal with the anxiety. Racing heartbeat. Endless loop thought patterns. Paranoia and irrational thought. I wracked my brain for what had changed. I started experimenting with ways to fix myself and finally locked in on changing my multivitamin. I also backed off on my thyroid meds, which increased my all-over body pain. The anxiety eased. I accidentally took the multi-vitamin again. My anxiety sky-rocketed. I got off them. A week later I was feeling a little better, although I realized that over a few months my immune system had gone to heck, and, come to think of it, my allergies were worse. I went to my doctor’s office. I’m a big believer in integrative, natural medicine (as is my physician father). I’ve written about my past successes with it HERE and HERE. Last year, after my symptoms started post-hysterectomy-anesthesia, they’d noticed my homocysteine had doubled. They put me on active folate and tri-K. This year when I came back and told them about my reaction to the multivitamins and other systems, they tested me for MTHFR, a gene mutation that they felt explained my overreaction to anesthesia and inability to recover from it. My allergies and cruddy immune system. My inability to handle wheat and dairy. We learned my multivitamin had folic acid in it, which is basically poison to someone with MTHFR mutation. And we learned that, yep, indeed I did have the MTHFR mutation. They also said that because of this stockpiling of “poisons” and the prevalence of many other environmental toxins (that impact all of us), I should undertake not just MTHFR protocol, but also a comprehensive detox program. They warned me I would feel worse before I felt better (they were right, and that’s where I am right now, unfortunately). So I’ve been detoxing in accordance with the protocol at MTHFR.net, where you can read all about what MTHFR is and how to get tested and treated for it. 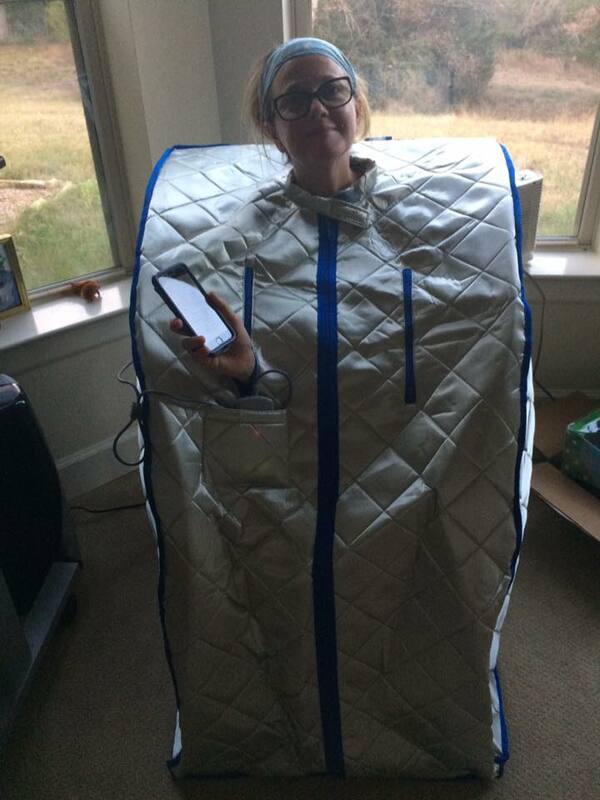 I won’t bore you with the details, other than an exciting picture of me in a portable infrared sauna. They’re funny looking, but they’re supposed to work, and I’ll try anything. Sure, I feel a little angry now that I’ve learned how easy it would have been for my anesthesiologist to ask a few more questions so he wouldn’t accidentally poison me with something it has taken my body 1.5 years and counting to get rid of. But I’m grateful beyond measure it didn’t kill me, and now for answers and a program that gives me hope. It’s too early to celebrate, but I’m feeling pretty merry, and hopeful. Hope is the important thing. So what I plan to do this Christmas is breathe. Continue to recover. Believe. And not pressure myself to write, at least not yet. Eric and I are going to play with our dogs, ride our big horses, and embark on a yaupon eradication program at Nowheresville. Wow! I guess it was September-ish of 2015 when we sat in the Bookmobile and visited. Your hysterectomy was still pretty recent then, and you desperately wanted to feel better. What a journey you’ve had. Thanks Marcy! And I know you’ve experienced similar struggles. Hugs and healing, love and light, darlin’. Well what a year 2016 has been for you and many of us. I’m just so glad you’ve found some answers. Enjoy your Christmas vacation, take care and look after each other. 2017 is only 8 days away. 2016 in the rear view mirror, won’t we all be so excited!!! Thanks Judith. You are in my prayers for quick and total solutions, once and for all! The Bible says we have the mind of Christ, we know all things, and that the memory of the just is blessed. God will turn this around for you so you once again have that sharp, crisp mind you’re used to!!! I’m so sorry for all your health issues. I know there was a time, in my thirties I had unexplainable issues. How frustrating it can be. If you need help eradicating yaupon (been there, done that), or riding big horses, I volunteer. It breaks my heart to read it all condensed here and to know how tough this time has been for you. I wish I could carry it all for you. I am proud of you for never allowing yourself to be defeated. For never giving up, for trying, researching, experiencing, testing, learning…….. I believe that you are on the right path now, and while I think there is still some fine tuning in terms of supplements and regime and food I believe in what you are doing. I know how difficult it has been but I also know that you have always been in there, sometimes a bit clouded but never a doubt that YOU are still completely YOU, and that is pretty awesome. Thank you for still seeing ME even when circumstances make it harder <3 You are the world's best husband, hands down. You will write when it’s time. Enjoy your healing and time off. I am so sorry to hear what you’ve been through the last year and a half. We will keep you in our prayers that you have finally found the “solution” to your ills. May you continue to improve and feel better until you are back to “normal.” (It differs for certain people, y’know! 😉 ) Hope you and yours have a joyous Holiday Season. And some are less normal than others 😉 Love ya Big Lar! WDKY! You’re supposed to write what you know! Fight the good fight! MTHFR is aptly named! Merry Christmas to you! I may be in Nowheresville New Years Eve! Looking Forward to 2017! We shall be at the Burton Roadhouse for NYE. If you’re in town and aren’t there, let me know and maybe you can come out and I can make you coffee and let Petey and the gang lick you to death. I’ll look for you there! Party like it’s 2017! <3 Blessings to you, Trey, and Jamie as well. Thank you Laura! I was horrified and yet delighted to read about your anesthesia experience and am now wondering if that’s what happened to me. I can tell you that I have many surgeries, but the one when I got “spayed” was the worst. I have never felt the same since. Like you, anxious, heart racing and much more. It’s been years now and I keep wondering what happened to me. I’m going to explore this detoxing thing and see if that would be of benefit to me. Now, you rest up, “get to feelin’ better,” and come back to us with another marvelous masterpiece. I absolutely love your work. Can’t wait to read more. In fact, I get a bit of “DTs” when I’m in between them waiting for another. 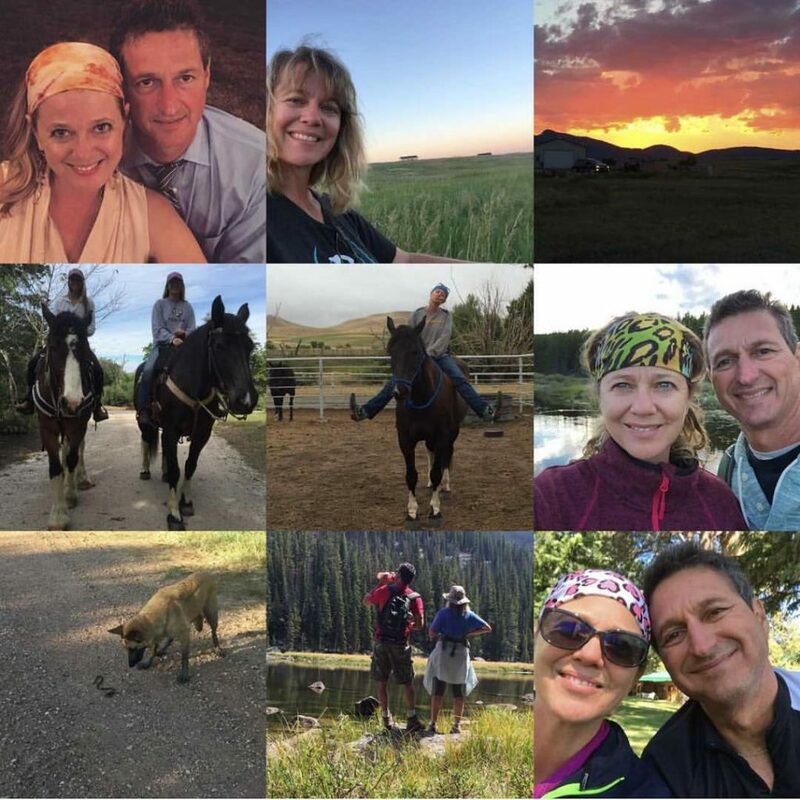 Happy Holiday and Happy New Year to You and Yours…. Lainey! Definitely you should check it out. The Doctor whose site http://mthfr.net has the great protocol for detoxing and adding active folate and active b12 into your life puts it this way: it’s not going to hurt you to try the protocol, so WHY NOT? So sorry you had a bad experience too. I’m starting to have flashes of feeling a little better/more like the old me. You’ll be in my prayers. Hoping to get back to writing in January!!!! You are an amazing woman, and it’s your perseverance and His miracles that have set you on the road to solutions. This is almost too complex to comprehend, and your transparency will help others who are struggling with similar issues. You are the heroine of this story, and you will slay this dragon! Today is January 1st, 2917. 2016 is in the rearview mirror! Celebrate and chillax with your sweet,supportive hubby and the many furry babies. We can wait for your next great novel…but it’s hard! <3 Thank you Pat! Happy New Year.